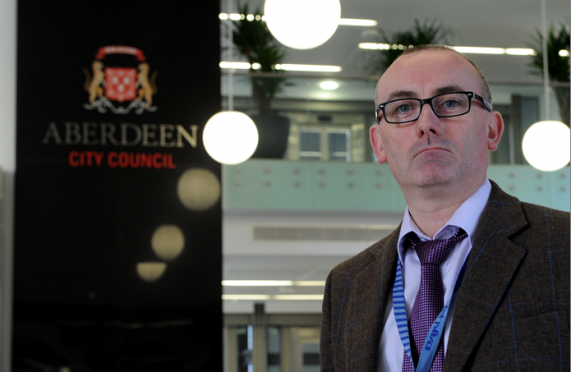 Graeme Paton, trading standards manager for Aberdeen City Council. City council trading standards officers have issued a warning after the pensioner from the west of the city was scammed by rogue traders for gutter works. The woman, who is in her late 70s, answered her door to a cold caller last weekend who asked if she wanted the gutters cleaned on her house for £60, which she agreed to. But when the scammer went onto her roof he did not bother cleaning out the gutter – instead using his time to remove slates to trick the pensioner into agreeing to further work. He told her she needed £7,500 of work carried out and accompanied her to a bank where she withdrew £4,000 “for materials” and gave it to him, saying he would return later that day for the rest of the money. But a vigilant family member intervened and called the police, scaring off the conman. Trading standards officers are now investigating the scam, and urged people in Aberdeen to be vigilant against cold-callers. Trading standards manager Graeme Paton said: “This was a despicable action to a vulnerable pensioner who lives on her own being scammed out of thousands of pounds for work on her house which wasn’t needed. “We’d always advise people to protect themselves from doorstep crime by if they’re not sure who is there, do not open the door. Aberdeen Donside MSP Mark McDonald called the incident “an atrocious scam”. He said: “Every community has vulnerable people in it so communities need to remain vigilant against these sort of scams. To report suspicious activity to trading standards, call 03000 200 292, or e-mail tradingstandards@aberdeencity.gov.uk. Alternatively call the police on 101.